For those of you unable to come to the church through illness or infirmity, we are pleased to bring Holy Communion out to your home and / or to visit. We firmly believe that ministry is from all and to all, taking place both in the building and outside in the community. 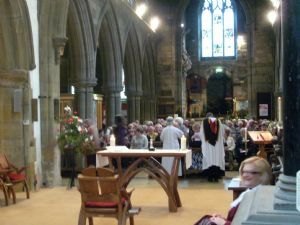 Our Patronal Festival is held on the last Sunday of September. Our Harvest celebrations are generally on the first Sunday of October. An auction of produce is held after the 9.30 Parish Communion followed by an excellent lunch in church. Remembrance Sunday service is held at 10.45 a.m. with silence being observed at 11.00 a.m.